Since 1989, Image has hosted a conversation at the nexus of art and faith among writers and artists in all forms. As the conversation has evolved, certain words have cropped up again and again: Beauty. Mystery. Presence. 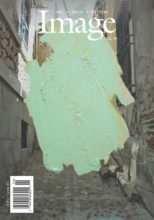 For this issue, we invited a handful of past contributors to examine our common lexicon as a sort of personal inventory on the part of the journal. Were there words we were using too glibly, we asked, words that needed to be reconsidered, revitalized, or tossed out? The writers’ responses surprised us. Some pieces retain an element of that self-critical spirit we requested, such as the essays on beauty and suffering. But the majority of the essays ended up as a referendum on the power of language, like art itself, to represent and reveal. Words, the writers seemed to say, deserve to be weighed heavily. On consideration, some words that seem simple or obvious are more demanding than we think. Language is double-edged. On the one hand, the ability to call things by their names can connect us to others, and can anchor an artist in the created world. Perhaps language itself even offers an image of the divine. Some would even go so far as to say that language is what makes religious experience possible. But at times, even after long wrestling and careful study, language can seem inadequate, more a stumbling stone than a pathway. Sometimes language seems able only to point to things just outside its reach, things we crave but can’t grasp, things we dare not approach, things we draw back from in awe or revulsion. This collection of short essays demonstrates the push-pull relationship believing artists have with words: We are in pursuit of a God who is revealed through the poetry of the oldest Psalms, but whose true name is impossible to pronounce. These essays originally appeared in Image issue 75.